“Changing the legal and judicial system to further align it with other Member States is a national task” and a fundamental reform of the judiciary should be seen as a national priority. This is one of the most important messages in the fifth monitoring report of the European Commission under the Cooperation and Verification Mechanism (CVM). The Mechanism has been imposed on Bulgaria (as well as on Romania) in 2007, when both countries joined the EU, in order to ensure that they will make the necessary reforms in the legal and judicial system. In its fifth report the Commission unambiguously indicates that establishment of rule of law is a mission of the whole society, not just of the institutions. Not accidentally, the position of the civil society is widely covered in the report - it was mentioned 8 times, moreover in terms of an active participant with a corrective role. 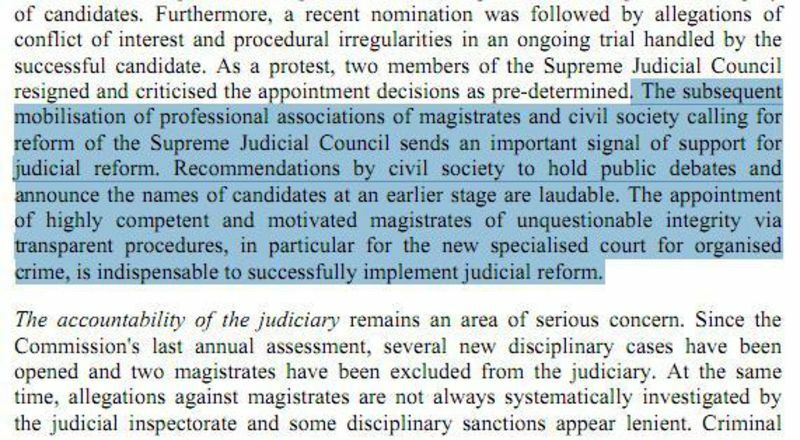 This is an important signal, given the resistance against the CVM, which is particularly strong in the institutions most criticised in the report - for example, the Supreme Judicial Council. This has not passed unnoticed by the Commission, which reports on the positive role of the CVM in promoting changes, although “at times the CVM has been contested and criticised by one or other element of this necessary national consensus”. The report clearly states that nearly five years after joining the EU, Bulgaria must shift the focus: “The elements of the legal framework needed for the reform are now largely in place, even if not complete,” so “the next necessary steps in this process should focus on implementation by the judiciary and the police of the new laws”. From this perspective it becomes clear why most of the criticisms are focused on the judiciary and its leadership – because there the adopted legislation should be implemented in practice. Bulgarian judicial reform has two long-term goals - to improve accountability and increase the professionalism of those working in the system, the report recalls. The amendments to the Judicial System Act have created the legal basis to achieve these goals, improving procedures for appointments, training and appraisal, as well as for strengthening the integrity of the magistrates. But: “The Supreme Judicial Council (SJC) will need to show a strong commitment to reform by translating the new law into practice in order to effectively strengthen the management of judicial bodies, notably in terms of allocation of workload, in close cooperation with the Ministry of Justice, professional association and civil society”. Despite the amendments to the Criminal Procedure Code, the judiciary does not make a serious effort to meet the recommendations of the Commission in terms of improving the judicial practice, as well as the recommendations for systematic persecution of allegations of corruption among magistrates. Where is the General Prosecutor? The acquittals in a number of cases involving high-level corruption and organised crime are again an emphasis in the report, because they show “serious deficiencies in judicial practice”. 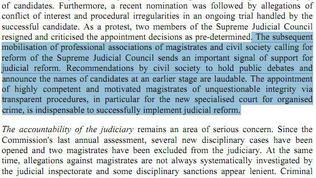 Although this is a permanent criticism in the CVM reports, “these deficiencies have not been properly analysed or followed up by the leadership of the judiciary, the Supreme Judicial Council, the General Prosecutor and the President of the Supreme Court of Cassation.” So far, the prosecution has behaved as though it has nothing to do with the report and has successfully avoided the punches in the fight between the executive and the judiciary. Is there a fight against corruption? Bulgaria continues to implement an integrated strategy to prevent and sanction corruption and organised crime and several measures have been taken, but “at the same time, the 2010 action plan focusing on tackling organised crime has not been fully implemented and has not been updated in 2011.” In this regard the Commission recommends greater involvement of the civil society through the participation of external experts in assessing the results of the strategy. The BORKOR project is also expected to deliver concrete results. Conflict of interests is also not pursued effectively enough as the newly created dedicated commission is not still operational. The European Commission expresses concerns over “weaknesses in asset declarations and verifications of politicians, magistrates and senior civil servants” and expects false declarations and discrepancies to be effectively sanctioned. “In spite of persevering police actions to tackle organised crime, the overall results need to be significantly improved”. 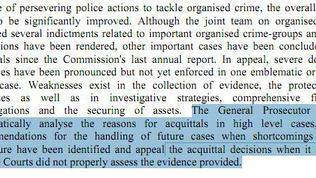 The Commission recommends police reform to be continued by “addressing shortcomings regarding the integrity and independence of police action, evidence gathering and witness protection”. In the technical update, accompanying the report, the issue of police practice to accept donations from private and legal persons to finance its operations is also raised. According to the Commission, “this practice challenges the independence of police investigation” and the issue requires further follow-up. As expected, the Commission continues to insist Bulgaria to adopt urgently a law on asset forfeiture, although the draft legislation has recently been rejected by the Bulgarian Parliament. The Commission expects Bulgaria to have proper legislation allowing “non-conviction based confiscation and ex-officio verification of assets of senior officials, magistrates and politicians” and to show concrete results in its implementation. 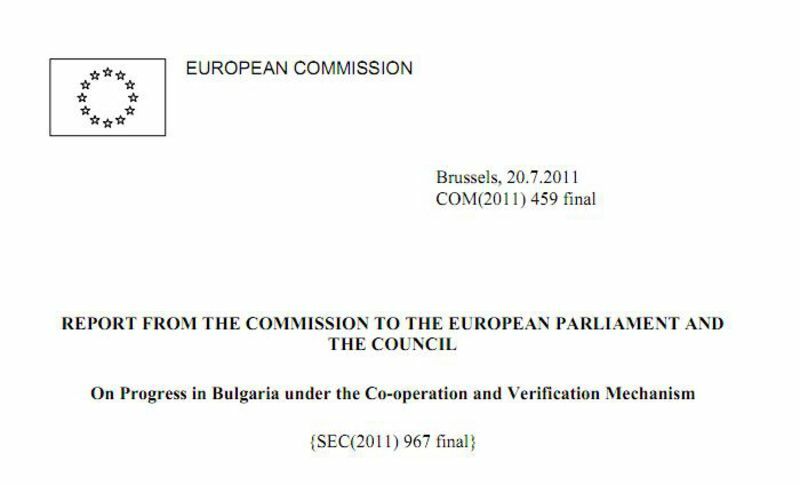 In 2012, 5 years after Bulgaria and Romania joined the EU and the Cooperation and Verification Mechanism has been launched, the Commission will make an overall evaluation of what has been achieved. Despite persistent efforts of Bulgarian and Romanian journalists to understand whether this means that the CVM may be abolished, European Commission spokesman Mark Gray answered briefly: everything depends on the results, which Bulgaria and Romania will achieve. He refused to comment on how the reports on Bulgaria and Romania would affect the assessment of the Member States on Sofia's and Bucharest's readiness to join the Schengen area. But looking at the Bulgarian document it is obvious at first glance that one of the main requirements of our partners in the EU is not fulfilled – to show results in the fight against organised crime and corruption. For comparison we should note that in the report for Romania we can see a lot of criticism too, similar to that in Bulgarian, but a few key words make an impression. Romania has taken “significant steps” in some of the most important areas, the fight against corruption must “remain” a top priority (which means it is already a top priority) and Bucharest should “increase the pace of judicial reform” (as obviously it is currently under way). Now we will hear another portion of mutual accusations between the executive and the judiciary. The first sharp reactions to the report are already a fact, but we will comment on these in a separate text. If, however, we assume that there must be a “positive hero” in the report - this is the Bulgarian civil society in the face of all those who keep pushing for a change. Now these efforts are taken into account and supported by the European Commission, which is clearly saying to the Bulgarian government: listen to the voice of your own citizens, give them a say, involve them into the overall effort to reform. Because, while the SJC believes it is self-sufficient and untouchable symbol of the (judicial) authority; while the police and the court are accusing each other, instead of working together; while the government is looking only for praises when reading the CVM reports; while citizens keep idly sitting side and waiting - there will be no judicial reform, no qualitative investigations, no convictions on important cases. 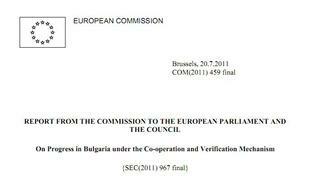 This is what the Bulgarian institutions and Bulgarian citizens must understand from this report. Five years later, it is time for us to realise that Bulgaria really is a member of the European Union and should become a really normal state. Nothing more, nothing less. Read euinside's analysis of the 2010 CVM report here and a summary of the discussion on the CVM, organised by euinside and blogeurope - here. EU Commission failed to investigateviolations of judges' fundamental rights by Supreme Judicial Council(SJC) and Supreme Administrative Court of Bulgaria (an employee ofSJC) which is responsible for reviewing disciplinary decisions ofSJC. EU Commission is much more concernedabout criminals' fundamental rights.